The June 2017 Criminology board exam or Criminologist Licensure Examination (CLE) results were officially released online today, June 30. The alphabetical list of passers (P-Z Surnames) is now posted online. 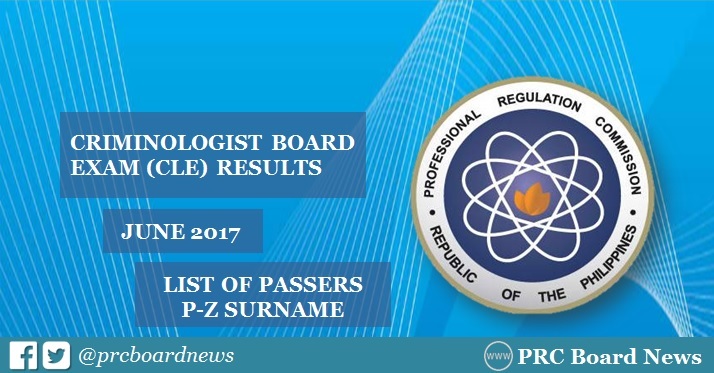 The Professional Regulation Commission (PRC) and the Board of Criminology conducted the licensure exam on June 11, 12 and 13 (Sunday to Tuesday) in Manila, Zamboanga and all regional offices nationwide. Note that all passers should personally register and sign in the Roster of Registered Professionals. Monitor announcement of results on this page or visit the official website of PRC. Bookmark for quick update.